Playful with their family and having a mind of their own, the German Shar-Pei often gets plenty of attention due to its looks. A perfect blend of both the Chinese Shar-Pei and German Shepherd, the German Shar-Pei is a hard working breed that can fit into any dwelling as a calm and constant companion. Intelligent, loyal and independent, the German Shar-Pei is a wonderful dog with unique features and a unique personality. This is a dog that tends to be loving and very affectionate with members of his family while being suspicious and aloof with strangers, which makes them excellent as guard dogs. The large sized breed of dog is the result of crossing the German Shepherd with the Chinese Shar-Pei. The result is a versatile dog that does well in a range of dog activities; although they do have a stubborn streak, making them not the ideal breed for inexperienced owners. The breed is known as the German Shar-Pei as well as the German Shepherd Chinese Shar-Pei or the Chinese Shar-Pei German Shepherd and is still fairly new when it comes to the designer breeds. The German Shar-Pei is a fairly new cross and there hasn’t been a lot of information put out about them. What we do know is that this mix breed is usually the direct result of crossing a German Shepherd with a Chinese Shar-Pei. The breed is still relatively unknown and there are no known breeders who are creating pairings between F1 or F2 generations; however, as more become familiar with this breed, directed breeding may begin. While there is not a set appearance for this breed as of yet, Chinese Shar-Pei German Shepherds tend to take after their German Shepherd parent more than the Shar-Pei; however, you should see the influence of both in the pups. In general, the German Shar-Pei should be a sturdy looking, large dog with a rectangular build; being slightly longer than he is tall. The tail is usually thick like a German Shepherd’s and tapers at the end. Ears should be at the top of the head, large, triangular in shape and are often pricked like the German Shepherd; however, Chinese Shar-Pei German Shepherds can have folded ears like the Shar-Pei. The eyes should be hazel shaped and a dark brown. The muzzle of the Chinese Shar-Pei German Shepherd should be thick and rounded like their Shar-Pei parent. In addition, the German Shar-Pei should have wrinkles on the face, head and shoulders. The breed should be athletic and should have the appearance of a powerful working dog. The German Shepherd Chinese Shar-Pei is a large sized breed that should have a sturdy appearance to him. Overall, size can vary a lot between the mix with German Shepherd Chinese Shar-Peis ranging from between 18 to 26 inches in height and 45 to 90 pounds in weight. The German Shar-Pei is a breed with a very dense coat and should be well covered. They tend to have a thick undercoat and a short, dense top coat that provides weather protection. Depending on the coat type of the parents, the coat can range from short and brush like to long with feathering on the back of the legs. The average is a short coat that lies close to the body. With color, the German Shar-Pei is usually tan in color. They can be solid or have the markings of a German Shepherd with a black saddle and black mask. The German Shepherd Chinese Shar-Pei is an easy to groom breed that requires brushing once or twice a week. During seasons where they blow their coat, the breed will need to be brushed two or three times a week. Washing is very easy as the breed only requires a bath every few months and can be kept clean by wiping them down with a damp cloth ever week or so. . They can be prone to ear infections, especially with the drop ears like the Shar-Pei parent, so it is important to check ears regularly and to also brush their teeth weekly. Finally, nails should be trimmed as needed, usually a few times per month. 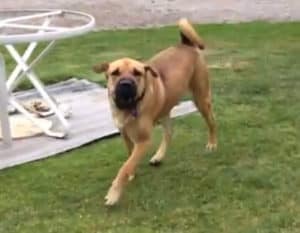 Loyal and affectionate with their owners, the Chinese Shar-Pei German Shepherd is a mix between two guarding breeds and this has resulted in an amazing guard dog with the mixes. Known for being intelligent, the German Shar-Pei enjoys work and thrives when it is in a family where that intelligence can be exercised through training or a dog sport. They tend to be very loyal to their family but both parent breeds are reserved and distrustful of strangers and this has resulted in the Chinese Shar-Pei German Shepherd being aloof and guarded with new people. They take their guarding seriously and will not only bark at something suspicious but also defend their family and property if there is a threat. They tend to be very alert and they can be a bit independent, which can make training difficult. Overall, the breed is strong willed, but they love pleasing their owners and spending time with them so with the proper home, the Chinese Shar-Pei German Shepherd can be a wonderful companion. The lifespan of the German Shar-Pei can be quite short, especially if they take after their Chinese Shar-Pei parent. On average, a German Shar-Pei’s lifespan is between 8 to 12 years. Chinese Shar-Pei German Shepherds tend to have average sized litters of 5 to 6 puppies; however, litters as large as 9 are not unheard of. Although the German Shar-Pei is a large breed of dog, they are very versatile when it comes to their living conditions. German Shar-Peis can do very well in any type of dwelling from apartments to homes with acreage. In apartments; however, they may bark if they hear anything suspicious; be sure to know your noise rules in your apartment before you bring a German Shar-Pei home. Training the German Shar-Pei can be a difficult task considering that the breed is intelligent and independent. What this means is that the German Shar-Pei tends to be stubborn when it comes to learning new commands. They do enjoy working; however, they tend to like it more when they it is something that they want to do. For that reason, a firm owner is needed that provides consistent rules and training. Training should start as soon as you bring puppy home and should be done daily. Train for short intervals to keep the Chinese Shar-Pei German Shepherd interested in training and use firm commands. Break up training with play sessions. Since the breed tends to be naturally aloof, socialization is very important and should include a range of different exposures both in the house and outside of it. With the German Shepherd Chinese Shar-Pei, socialization and training should be an activity that you do throughout the dog’s life. The German Shepherd Chinese Shar-Pei is an active dog, however, the amount of exercise that they need per day tends to vary depending on the parent that they are taking after. In general, Chinese Shar-Peis only require 30 to 60 minutes of exercise in a day and are not overly active. German Shepherds, on the other hand, are very active, make excellent jogging companions and require 1 to 2 hours of exercise per day. With that in mind, expect your Chinese Shar-Pei German Shepherd to require about an hour of exercise. They can do okay as jogging companions; however, if they have a Shar-Pei muzzle, they are more prone to heat exhaustion and should be exercised during the cooler periods of the day. As mentioned already, this is an intelligent breed so it is important to exercise their brain as well with activities, training and toys that will challenge their brain. Despite being a large breed, the Chinese Shar-Pei German Shepherd does not eat large amounts. On average, 1.5 to 2.5 cups of a high quality dry kibble will meet the calorie needs of your German Shar-Pei. The breed can do very well on RAW but it is important to make sure that your dog receives the right variety of food if you feed RAW. Treats can be given daily and can include fruits, vegetables, meat and dog treats. They should be offered water throughout the day. Since the breed is prone to bloat, it is important to break up meals into smaller servings and to never exercise your Chinese Shar-Pei German Shepherd 20 minutes before and after a meal. More reserved and calm than most puppies, the German Shar-Pei puppy is usually a little fluff ball with big ears and a heart of gold. They can be very playful and happy but they can take a bit of time to warm up to their new family since the breed is more aloof than others. German Shar-Pei puppies tend to have droopy ears that may go into a full pricked ear when they get older. During this time, be sure to check the ear regularly to catch any ear infections. The puppies tend to be as stubborn as the adults so it is important to set rules as soon as your German Shar-Pei puppy arrives home. If you do not want adult dogs on the furniture, then do not allow your puppy on the furniture when they are young to prevent challenges when your German Shar-Pei grows up. The breed does require plenty of socialization so be sure to start as soon as they have their vaccinations. If you keep up with training and socializing your German Shar-Pei puppy, you are sure to build an amazing bond with your furry pet in no time and truly see the playful, loyal and affectionate beyond that initial aloofness. The German Shepherd Chinese Shar-Pei is a breed that is not suitable for everyone. They can be a bit aggressive, especially if they are not properly socialized and trained, but even with proper socialization and training, they are a guarding dog and tend to be very suspicious of strangers. They can do okay with kids but are better suited to homes with older children. They do require a strong owner and are not recommended for inexperienced or timid dog owners. WE JUST RESCUED A GERMAN SHAR-PEI FROM THE MARIETTA OHIO ANIMAL SHELTER AND THIS IS EXTREMELY INFORMATIVE THANK YOU!! We acquired a German Shar Pei as a puppy and he has grown into the most beautiful dog ever. He is a really big boy at just over a year old, with an intelligent face and oh so keen to learn cool tricks. He is a little aggressive which makes taking him for walks very challenging as he wants to maul everything and everyone he sees (I think he is territorial and wants to protect me). We socialized him well with our other 5 dogs, that range in size from very small to medium size and although he is fine with the small dogs, he is very aggressive with out medium sized, much older, male dog. This breed definitely needs to be the leader of the pack and would probably do well with being the only male dog in the family.